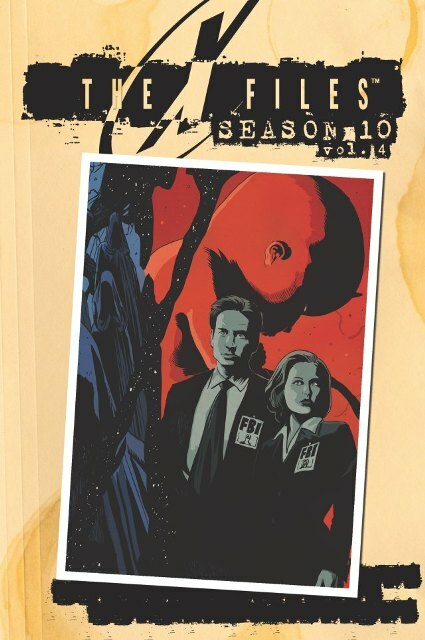 Nearing the finish line for IDW’s comic-book adventures of Mulder and Scully, The X-Files Season 10 Volume 4 collects issues 16 through 20 and tries to connect five standalone stories featuring most of the TV series’ main characters, but never fully resolving any of them. Sometimes the stories feel like a waste of time. There’s never enough pages needed to develop a complete story, only enough to jump into the action and wrap it up before moving onto another one. In Immaculate, Joanie Cartwright is involved with an abortion-clinic bombing in a case that involves difficult decisions, guilt, demonology and an odd penance. In the small town of Murphysville, North Carolina, something has gotten into the townsfolk. Whether it’s a clash of personal values, religion, politics or something not of this Earth, the citizens are restless. Notable for briefly utilizing a Frank Black crossover (which makes sense, since IDW is doing a Millennium miniseries), the art isn’t anything to write home about (Frank Black looks more like his actor counterpart than this interpretation of Dana Scully, and that’s saying something!). Even though it’s briefly mentioned here, Chris Carter and the Ten Thirteen Productions team has reiterated many times throughout the years: Frank Black is NOT a psychic! Misunderstanding the profiler’s abilities and stating it as a fact is just wrong. Coming from a Millennium fan, that’s blasphemous. Supposedly, Chris Carter is the Executive Producer to this comic series. If that were true (and these X-Files stories are actually canon), that element would have never been included in this book. Great dialogue by Frank: “If you knew the things I knew, Agent Mulder… your hair would be gray too.” Trivia fun fact: Lance Henriksen HATED dying his hair black for the TV show and enjoyed his natural color making an appearance near the end of Millennium! In the second story, Monica Reyes has been kidnapped and John Doggett has been overcome by a strange spiritual awakening. There’s really not a lot that happens here or really any character development taking place, whatsoever. Mostly a page-filler storyline featuring two missing-in-action agents. Skip this one. Looking at this collection as a whole, it feels like a huge stretch to create one overall storyline stretched over five issues to include all the major characters, while somehow never resolving any individual tales. Odd situations like characters talking to themselves as if they’re sharing an onstage monologue and an extended conversation involving a helpful Cigarette Smoking Man and Mulder, together, were both unbelievable and the worst offenders, here. The art is still bad, the writing has slightly improved and Agents Mulder and Scully still seek the truth, but this version of the pair seems to conveniently forget (or better yet, ignore) the culmination of their previous nine years of working on the job together, as seen on the FOX network. At its peak, the TV show expertly dealt with rumors, conspiracies, governmental urban legends and unknown innuendos with abandon. Slowly but surely, this comic series has gained its footing and is slowly but surely climbing up to that level… it just took IDW 20 issues to get there. Only five more issues remain to be released before Season 10 concludes, so that means there will be one more collection to wrap up this series. With Season 11 already announced (along with the introduction of a comic series devoted entirely to Millennium, IDW has succeeded in practically reviving the pop-culture cache of Ten Thirteen Productions. And with the announced six-episode event miniseries airing on FOX in 2016, this may just be the year to finally believe in Chris Carter’s creations having lives of their own, with or without his approval. Strength: A Millennium crossover story! It’s the strongest of the bunch. Weakness: Too bad Immaculate wasn’t extended to multiple chapters. It deserved more. WTF Moment: Hopefully the upcoming Millennium series won’t include storytelling errors that conflict with the TV franchise. This X-Files series feels like it isn’t canon at times, so hopefully Frank Black’s stories don’t get misconstrued as well.